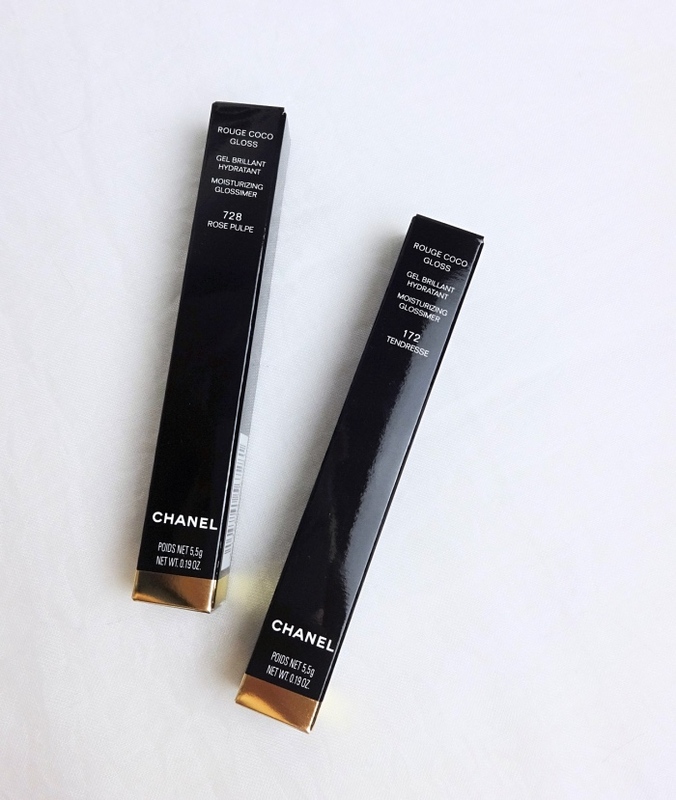 I didn't have good pink lip gloss (no, really) and also wanted to see if Chanel had reformulated Glossimer for better indeed (not for an excuse to raise the price). Trust me, I was ready to criticize and almost wanted them to fall short of expectations. But, what can I say? I fell in love with them and might get a few more very soon. I wasn't joking about not having good lip gloss before. It's just that I hadn't bought lip gloss in a while and spent my lunch money on various lip tints and matte lipsticks lately. I'd say now I am more open-minded about lip colors in general (compared to when I insisted on sheer glossy ones only) but I also have drier lips from being adventurous. 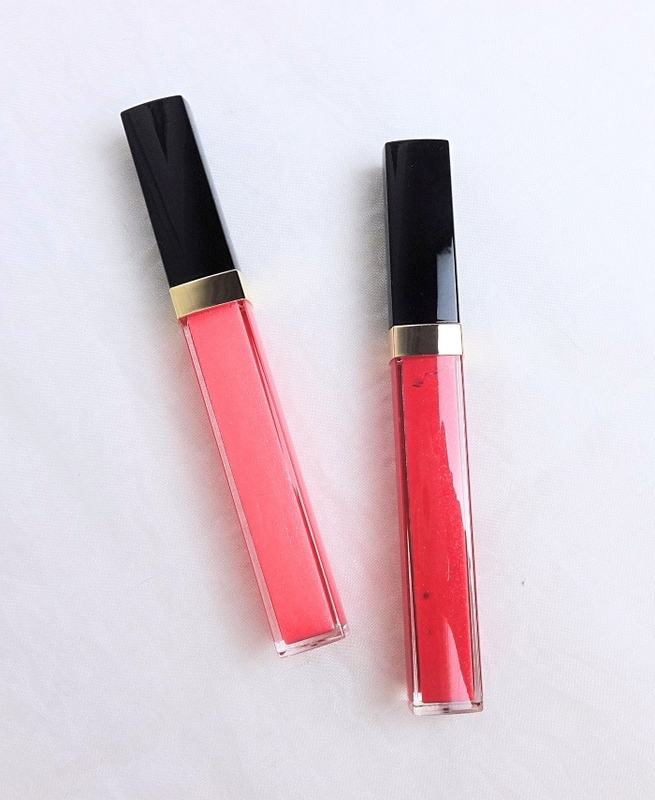 I have found a couple of long lasting Korean lip tints (Beauty People Lip Tattoo & Berrisom Oops My Lip Tint Pack) that are not as drying on lips and sport them very frequently because of the convenience. I still need "good quality" lip gloss to wear on top so that my lips stay moisturized and flake free. The visual effect of the combo is quite flattering, too. 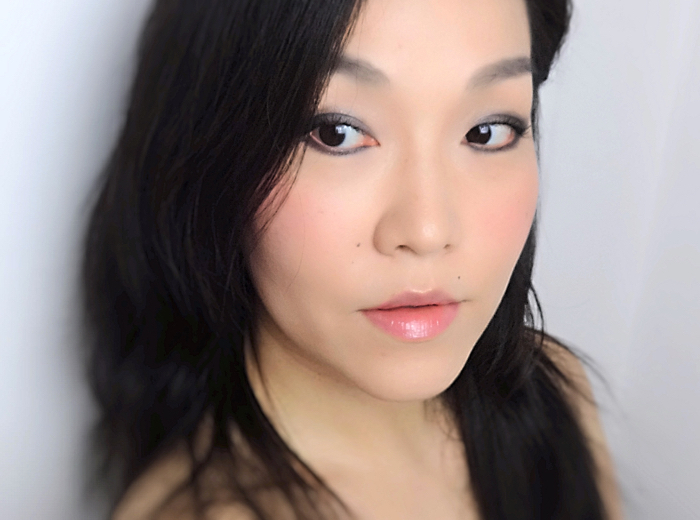 I hear some of the reformulated Glossimers are much more pigmented, but the two colors I picked are pigmented moderately which feels quite appropriate for its lip gloss form. 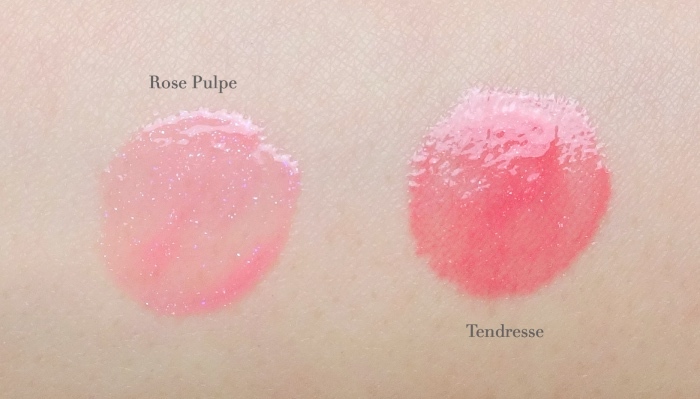 I chose Rose Pulpe mainly to add on top of lip tints. Tendresse can be both layered and worn alone. 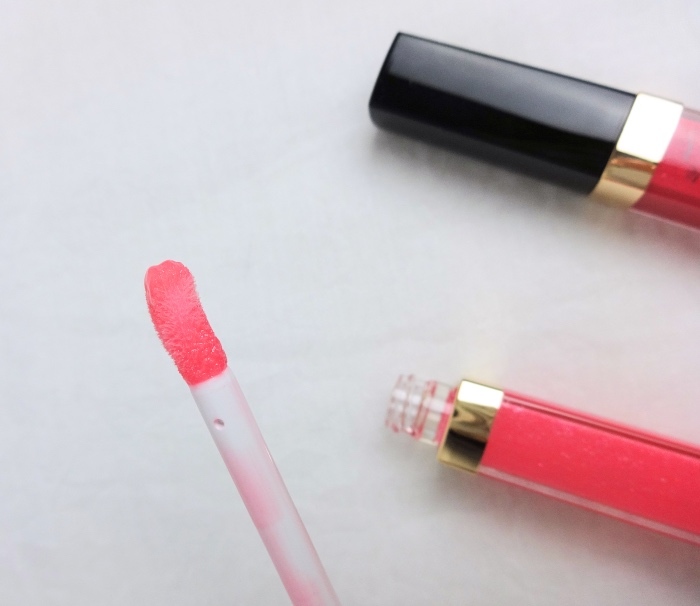 The colors are super pretty and have just right amount of shimmer that makes my lips appear fuller and more youthful, but the formula and the new doe foot applicator is the real game changer. The gloss formula is thick enough that it doesn't smear off but not sticky. It stays on fairly long and fades away clean (meaning it does not ball up because you took a sip of water). 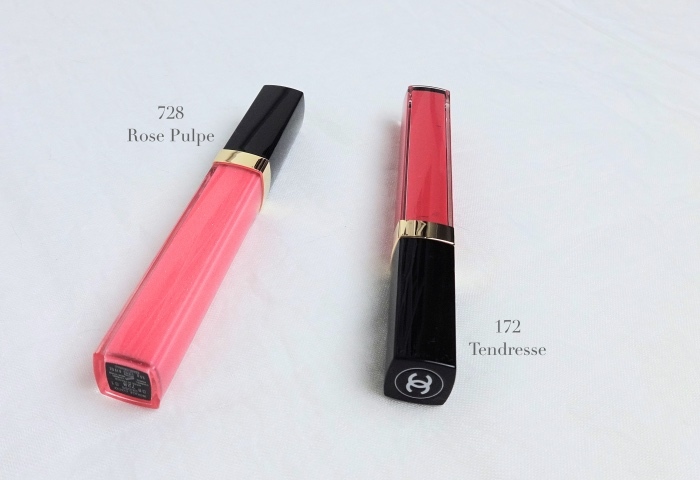 Chanel Rouge Coco Gloss is scented with the same fragrance I detect from the Rouge Coco lipsticks but very lightly so. The applicator is much better, too! The new one is slightly bigger and angled. It feels plush on the lips and does a great job distributing the color evenly and quickly. Both colors appear sheerer and cooler on my lips than on my arm. I love the way the colors translate on my lips, which is why I want to grab a few more in brighter shades as well. Here are a couple of overall looks with Rose Pulpe and Tendresse. Hope you find these swatches useful! Overall, I am quite happy with my purchase. $30 plus tax for a tube of gloss seems steep, but I know that I will wear them very often. I've spent enough to finally realize it is still cheaper than more affordable one that I never reach for. I used to be all about Rouge Coco Shine but I agree that the formula should be better for the price. It was a bit less than their pigmented lipstick lines but not it's the same. -_- However, I do love the Rouge Allure so much. I also have Rouge Allure gloss (both old and new formulas) and find the new Rouge Coco Gloss is as good with more color options. They are cheaper by 7 bucks, too. Beautiful! 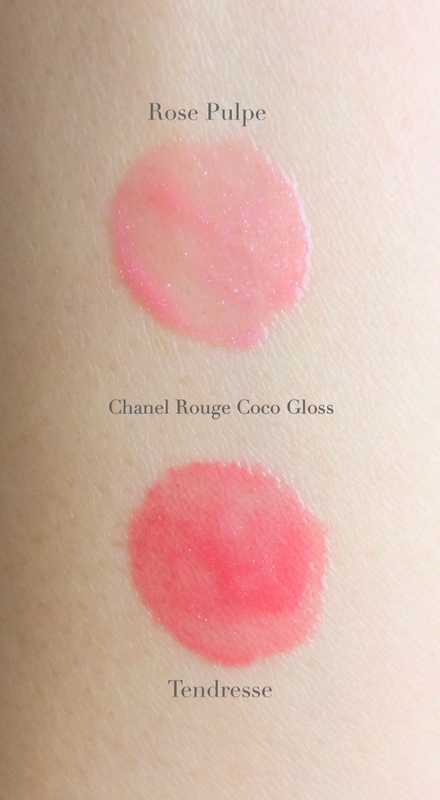 I never tried the coco glosses before but do have an allure gloss which I like, will have to check these out! 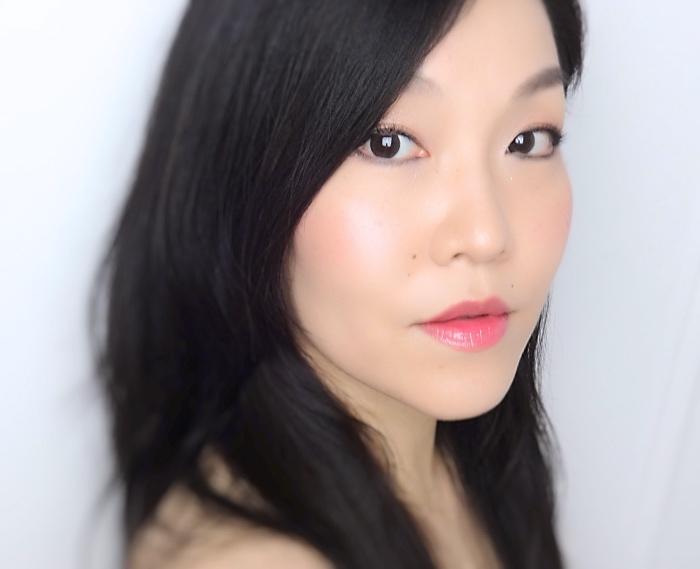 I love Rouge Allure Gloss, too! I actually miss that sturdy old packaging, but the formula has been consistently good, I think. Looks like color opacity differs case by case, but for sure this is an excellent gloss formula. Ooooh the subtlety of these are just gorgeous Lena! They're like barely there but still make such an impact. I go by a cost per wear for things that I buy and the ones that you reach for on a regular basis pretty much always end up being the most worth it :D Love the way your hair looks in these shots too!!! I used to love glosses and then fell out with them in the last few years. Until I got one of these a couple of weeks ago, wow!!! They are everything I want in a gloss. I went out and got another color and am thinking of getting one more! I find them so moisturizing, soft, long lasting, and the 2 colours I have (chilli and caramel) and actually super pigmented for a gloss! I agree with you totally that expensive well used is cheaper than cheaper unused. Tendresse is so cute on you! Wow it doesn's say "unknown" haha! Ooh, you have these, too! Glad to hear you enjoy yours! I was looking at Chilli but I have Gabriel in Rouge Allure Gloss formula and couldn't justify having two cool toned red gloss in my stash. I want to get one of the more pigmented ones and maybe a vampy shade. Oh! They look so juicy on your lips. I especially love Tendresse. I don't like to wear gloss usually... my hair just gets stuck on my lips all the time. LOL! Rose Pulpe is sooo beautiful! 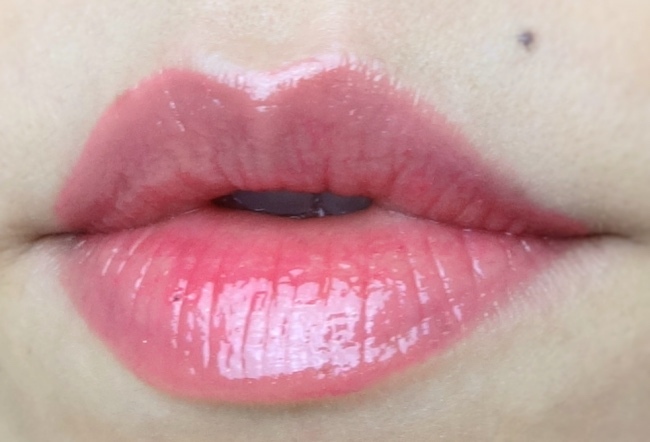 I always appreciate a beautiful gloss with micro shimmer. I find that high end lipglosses wear and feel great, especially if they wear well and don't leave mucky corners after hours.